leather jacket With Tassels. Condition is Used. It says size Medium but I’m 44-46in chest and fit me fine, it’s in good used condition, I haven’t worn it for about 2 years so time for it to go having a wardrobe clear out. Black leather biker style jacket in fabulous condition. Lovely soft leather with stud fastenings to collar and cuffs, three stripes to arms, zipped outer pockets and inner pocket. 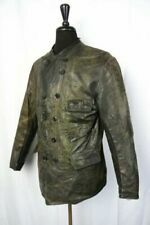 Men's Italian black leather jacket, lined, hardly worn size Large, great buy. Condition is Used but still loads of wear as hardly worn. This is a really great buy. 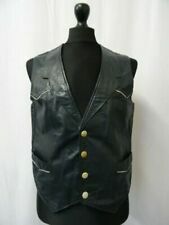 New listingMENS BLACK LEATHER WAISTCOAT POSS GAY FETISH SIZE XXL CHEST 46"
Black leather fully lined waistcoat with lacing detail to sides and shoulders. Size label xxl - chest 46" length 22". Genuine leather. Excellent condition. Popper fastening. 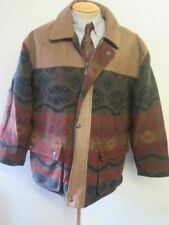 Mens Leather Patchwork Vintage Look Jacket XXXL. Condition is Used. Dispatched with eBay delivery – Shutl 1 day. Condition is Used. Ribbed outside collar, both wrists and waist band. Zip front with four front pockets. 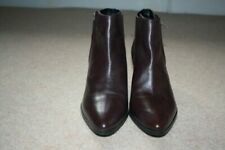 Great condition soft leather, comfortable to wear. Full length grey coat, in excellent condition considering its age. Sadly belt buckle is missing. Any questions please just ask. Large 46 inch leather jacket good quality leather only been warn once or twice, jacket shoulder to shoulder is 49cm, from shoulder to cuff 65 cm from armpit to cuff 45 cm down the back from coller (68 cm good condition. TAN LEATHER. FRONT ZIP, 2 SIDE POCKETS, ELASTICATED CUFFS AND WAIST. 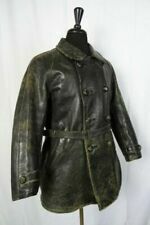 Brand new Men’s Leather Coat 5XL XXXXXL. Heavyweight, well made stylish coat. Dispatched with Parcelforce 48. Features a leather buckled belt at the waistband and two front pockets. This Jacket had 3 front pockets and 1 inside pocket. A mint condition BNWOT Ashwood Leather Gilet made from buttery soft Lambskin Leather with satin lining and adjustable back. 2 x Front (Watch) Pockets plus 1 Leather Faced Inside Pocket. 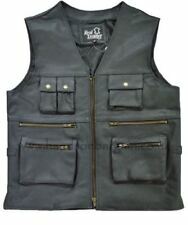 This smart looking gilet can be worn either casual with jeans & a T-shirt, or smart with a shirt, tie & trousers. Size Large (NEW). Size Large. Bust line - 116 cm. Shoulder line - 17 cm. This is a brown leather steerhide jacket. Size large 44 chest. Immaculate condition as photos show. Any questions feel free to message. Mens Retro Brown Leather and Suede Jacket - Medium. Condition is Used. Dispatched with Royal Mail 2nd Class. Black leather coat. Thigh length. Three deep pockets on the outside. Buttoned cuff. One internal pocket. Button fastened. One button missing. MENS 100% LEATHER VIN DIESEL STYLE BLACK ZIP BIKER JACKET SIZE 4XL - RRP £69.99!